Harry’s father, James Steer, came from Surrey; he was born in Send, near Ripley, in 1870, the son of a coal merchant, and in his youth he was a carman on the railways. He married Emily Spooner from Guildford in 1893 and their son, Harry William Steer, was born the following year in Woking. 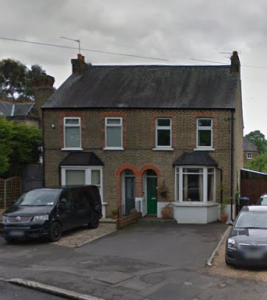 In 1901, the family was living at “The Cosy Cottage”, Broomhall Road, Horsell, near Woking. James was working for a book merchants’ manager and six-year-old Harry was at school. Left: Rose Villa is on the left of the pair of houses pictured. Harry had moved to East Sussex. He was Private 3430, a musician (possibly a drummer) in the 4th (Royal Irish) Dragoon Guards at Preston Military Barracks, Lewes Road, Preston, Brighton. Musicians were used to keep soldiers in formation. According to the Royal Dragoon Guards Museum website, drum-beats, in particular, could be heard above the noise of a column of marching men. Smaller instruments, such as fifes, added a melody to their steady rhythm. Bugles and trumpets were used as a means of signalling on the battlefield. By WWI, the battlefield role of regimental bands had faded and they had mainly a ceremonial function. Although trumpet calls were still used, the kettledrums that had once accompanied cavalrymen to battle, were not. In wartime, the bandsmen acted as stretcher bearers, dispatch riders, and in other non-combatant roles. In summer 1914, after the outbreak of war, Harry’s unit, the 4th Battalion of the Royal Irish Dragoon Guards, deployed from England to France with the British Expeditionary Force. The 4th was part of the 2nd Cavalry Brigade, 1st Cavalry Division. Harry’s medal records indicate that he entered the theatre of war on 21 August 1914 and it wasn’t long before the Division saw action. On 22 August 1914, ‘C’ Squadron charged a German cavalry column just east of Mons in what was the British Army’s first action of WWI. The 1st Cavalry Division remained in France and Flanders throughout the war, often serving in the trenches as infantry. While Harry was serving with them, the 2nd Cavalry Brigade was engaged at Mons, Marne, Aisne, La Bassée, Messines, Armentières, Ypres, St Julien, Frezenberg, Bellewaarde, Somme, Flers-Courcelette, Arras and Scarpe. On 24 September 1917, Harry transferred to the 15th (Service) Battalion (2nd Birmingham) Royal Warwickshire Regiment as Lance Corporal Steer, 32744 (sometimes recorded as 52744). The 15th was under the command of 13th Brigade in the 5th Division and was due to move to Italy with the Division in November 1917. In September, when Harry transferred, the battalion was fighting at Passchendaele, engaged at the Battles of Polygon Wood and Broodseinde. Harry had been with the Battalion for just two weeks when he was wounded on 6 October 1917. His death was recorded the same day. The village of Godewaersvelde is near the Belgian border, about 16 kms south-west of Ieper (Ypres). 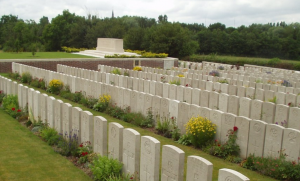 The cemetery there was begun in July 1917 when three casualty clearing stations were moved to Godewaersvelde. Casualties from 11, 37 and 41 Casualty Clearing Stations were buried there. 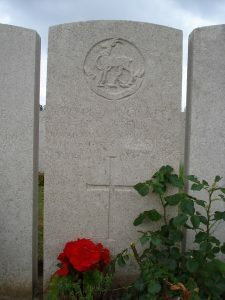 Harry’s headstone reads “He suffered and died heroically for all whom he loved.” The epitaph was chosen by his family and, from the records, the inscription appears to have cost 12s 10d. 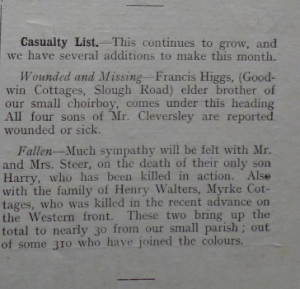 In November 1917, Datchet Parish Magazine published a notice of Harry’s death: “Fallen – Much sympathy will be felt with Mr and Mrs Steer, on the death of their only son Harry, who has been killed in action.”. The Windsor and Eton Express also carried an announcement on 2 November: “Steer, H.W. 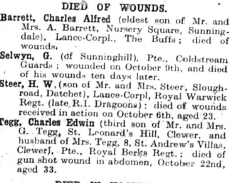 (son of Mr and Mrs Steer, Slough Road, Datchet), Lance-Corpl, Royal Warwick Regt (late RI Dragoons); died of wounds received in action on October 6th, aged 23. 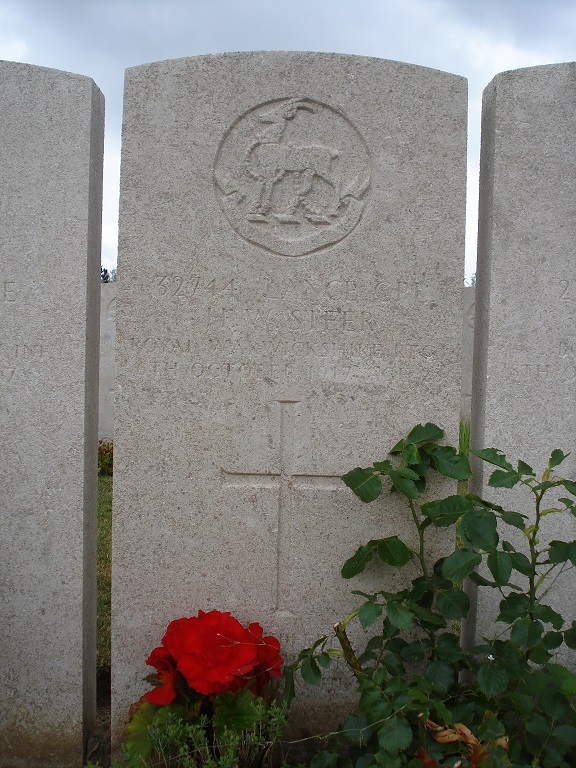 This photograph of Harry’s grave was taken by his cousin twice-removed, Phil Steer, who lives in Essex. (Harry and Phil’s paternal grandfather were cousins.) Phil and his wife and their children, the next generation of Steers and Harry’s cousins three-times-removed, visited Godewaersvelde Cemetery in 2010 and placed flowers at his grave. Phil explained that Harry was probably named in memory of his father’s brother who had died at the age of 16 in 1893.